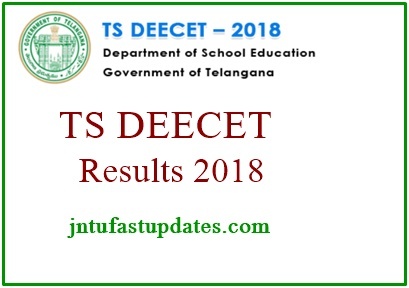 TS DEECET Results 2018 : The government of School Education Department Telangana has conducted the Telangana DEECET/ DIETCET examination on 1st June 2018. A large number of hopefuls have applied for the TS DEECET examination this year. The DEECET/DIET CET examination was conducted in a large number of examination centers across the Telangana state. Almost all 1 lakh hopefuls have attempted the TS DEECET examination this year. The TS School education board has released the answer keys soon after the examination completed. Aspirants who have come across the TS DEECET/DIETCET examination have checked with the answer sheet and evaluated the score. Candidates can check the Telangana Deecet results from the official website, deecet.cdse.telangana.gov.in. The TS DEECET Result, cutoff marks, and merit list will be released by the Government of School education department, Telangana on 8th june. The government of School Education Department Telangana annually conducts the Diploma in Elementary Education Common Entrance Test (DEECET) entrance test for admission into 2-year Diploma in Elementary Education course. This examination is annually being organized by the TS School Education Department is to offer admission in 2 years Diploma in elementary education in Private and Government District Institutes of Educational Training in Telangana. Yearly, many of the hopefuls compete for this examination to get admission in D.Ei.Ed courses. The competition is higher this year, as per the reports announced by Commissioner of School Education TS. A large number of candidates have applied for DEECET examinations from 21st April to 10th May. The Telangana School Education Department has organized the DIETCET/DEECET examination on 1st June in many examination centers. All the hopefuls appeared for the Telangana DEECET examination can check the results within 3 to 4 weeks after the examination (tentatively). Candidates attempted the TS DEECET examination can expect the results on June 8th or 9th. Candidates can check the TS DEECET/DIETCET cutoff marks at the time of results. Scoring the minimum cutoff marks/qualifying marks in the examination will lets the aspirants to move forward with the next rounds of selection process. Based on the merit of aspirants the admission will be given in D.Ei.Ed course. Aspirants will get admission in various Government affiliated colleges in Telangana. The TS Government of School Education Board will release the results, cutoff marks, and merit list on its official website, deecet.cdse.telangana.gov.in. Stay checking the TS DEECET official website on regular basis to know more updates regarding the examination date, and counselling details. For those who passed in deecet exam, Counselling starts from june 19th to 22nd, 2018 and students should choose options, certificate verification in respective colleges. How to Check TS DEECET Results 2018 Name Wise Online? Search for the TS DEECET 2018 Results links on the homepage. Click on the link.